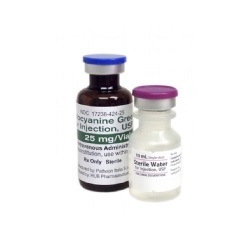 Indocyanine Green (ICG) 25mg for injection use. Each box comes with 6 ICG vials (25mg each) and 6 sterile water vials (10mL each). Manufactured by HUB. NDC Number: 17238-424-06. Comes 6 per box.